In the previous step, you learned how to protect a document. 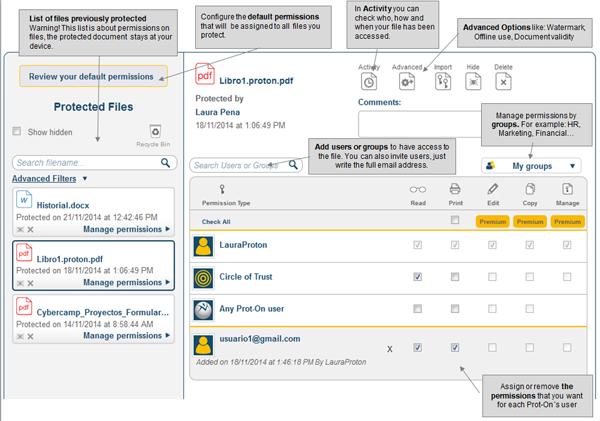 The next step is to assign permissions to the protected document. If the person you want to send your document to is not yet registered in Prot-On you can type their email in “add user” and invite them to become a Prot-On user. A user who is not registered in Prot-On or a user who has not been assigned the correct permissions will not be able to access a protected document. You can assign and remove permissions whenever you want, even after having sent the documents. IMPORTANT: Default permissions that you have configured are the permissions that all your files are initially protected with.